In the 13th century BC when Jason and the Argonauts made their legendary voyage to the kingdom of King Aeetes, they probably noted that the Black Sea coastline began to change dramatically beyond the area now known as Amasra. Except for the shifting deltas of the Kizilirmak and the Yesilirmak, wild and desolate mountains plunged to the sea and paralleled the coast all the way to the plains of ancient Colchis. It must have been an intimidating journey for those mariners: dark, choppy waters, tormenting exposed rocks, black sand beaches laden with iron, verdant, misty mountains slashed by river gorges and inhabited by fierce Amazon warriors. Phineas, the blind seer had warned them that dangerous birds on the island of Ares attacked humans so the Argonauts put on their helmets and made their way ashore shouting loudly. The birds rose with a clamor and abandoned the island for the nearby hills. Today, the offshore island at Giresun, Buyuk Ada, is thought to be the island of Ares where the Amazons erected a temple to honor the god of war. It is still occupied by large numbers of birds, mainly cormorants and gulls. During the annual Aksu Festival on May 20th, locals cast pebbles into the river to signify a release of the past year's misfortune. Then they take a boatride to circle the island three times from east to west and disembark on the eastern shore where they approach a huge black boulder that is reputed to possess magical powers. Pebbles representing their wishes are placed in small holes in the boulder and celebrations begin when they return to the mainland. The first community in this area was established as Kerasus in the 8th century BC by Greek colonists from Miletus. The coastal areas were later consolidated as the Kingdom of Pontus which attained its golden age in the 3rd century BC. By about the 1st century BC, the Romans had conquered the Pontic Kingdom and the Roman general, Lucullus, exported the first cherry trees to Europe from this region. Cherry orchards still flourish in the hills of Giresun along with hazelnut trees. South of Giresun from the village of Dereli, an unpaved road climbs to Kumbet Yayla, a high mountain pasture with stately stands of pine trees. Villagers extend their gracious hospitality to visitors, especially on the second Sunday in July when they hold their annual summer festivities. The small village supports a grocery store, restaurant and a modest hotel but camping out in the wide open space of the yayla is an unexpected delight. Snow clings to the distant mountain slopes even in the summertime. The cool, crisp air is fragrant and the expansive night sky boasts a million glistening stars that seem to dangle heavily from the heavens. From Kumbet Yayla, there are trails to other summer pastures including those near Yaglidere. They are mainly ancient animal paths that wind up and down the rugged land that was once inhabited by Mossynoecian tribes. When Xenophon passed through this area (401-399 BC), he noted that they performed private acts in public. Some scholars attribute their inappropriate behavior to the possible effects of 'crazy honey' or 'deli bal.' Even a small amount can make a man seem intoxicated. The pungent, sweet smelling flowers of Rhododendron luteum are found throughout the Eastern Pontus and are responsible for this unique honey that could disable an entire army. Trabzon is the main city of the Eastern Black Sea area. Like Giresun, it was founded by Miletian colonists in the 8th century BC and was known as Trapezus, probably because it was located on a 'table' of land above the harbor. Over the centuries, Trabzon became subject to numerous conquerors: the Persians, Alexander the Great, the Pontic Kings, the Romans, the Byzantine rulers, the Seljuk Turks, and the Ottoman Turks. This was due mainly to its strategic location at the terminus of the great overland route from China, India, Persia and Mesopotamia and was also the gateway to Constantinople and the markets of Europe. In spite of the successive rulers, the culture of the rural Pontic community remained relatively unchanged over thousands of years. It was the largest Greek speaking population in the Hellenic or Byzantine worlds. More recently, with the Exchange of Populations in 1923, Pontic Greeks who were relocated to Greece were found to be still speaking an ancient Greek dialect. They also brought with them their traditions of self-government and a medieval code of hospitality that acknowledged the dangers of travel in an unexplored and uncharted land. Some of the Pontic Greeks became Muslims and continue their agrarian way of life in the mountain meadows behind Trabzon. The main route to Trabzon from the Central Anatolian Plateau extended from Bayburt to Gumushane and over the Zigana Pass. Marco Polo traveled by camel along this path on his way home to Venice in 1295 after an absence of twenty four years. Although it gained prominence as a branch of the Silk Road, its function as a trading route dates back to the 17th century BC. Hittite artifacts suggest that they traded with the Kaska tribes who occupied the narrow coastal belt of the Black Sea during the Bronze Age. By the end of the 1st century BC, the Assyrians had taken Argyropolis (city of silver) from the Romans and used this route to transport the precious metal back to Mesopotamia. Now known as Eski (old) Gumushane or Suleymaniye, this ancient mining town has been practically abandoned. It is worthwhile to have a look at some of the old houses and churches that still hint of a bygone affluence as well as an engaging view of the Harsit River valley. After the mines became exhausted at the beginning of the 19th century, the town gradually declined and new Gumushane was established a few miles away where the Harsit valley widens to accommodate the growing economic dependence on orchards, vegetables and beautiful wild roses that are harvested for their rose hips. The old road from Trabzon to Gumushane is now less traveled. Beyond Macka, it becomes a tortuously winding road that is rewarding for its magnificent scenery of alpine pastures and pine forests. At the Zigana Pass, it is tempting to linger where the cool breezes whistle through the trees and eagles make their nests. Clouds swirl among treetops and in the distance, ridge after ridge of towering, arid mountains stand like sentinels guarding their secret passes. It is truly amazing to think of the thousands of people who made this perilous journey throughout the ages. The first independent medieval Greek state, the Empire of the Great Comnenoi of Trebizond, was established in the early 13th century when Constantinople was besieged and subsequently conquered by the Crusaders. This made little difference to the Pontic community that had operated autonomously since the 7th century. The Byzantine rulers were unable or unwilling to protect its Eastern outposts and the small community successfully defended itself against the Seljuk forces, Georgian expansionism and other menaces. The newly independent Pontic state saw a transformation of the main city of Trebizond as well as the outlying areas of the community. Trade flourished and this route became an important passage to Europe. Control of the land and sea routes fell to the monasteries that expanded their authority to encompass huge fortress-monastery complexes. Those by the coast were responsible for maintaining the lighthouses while those of the interior guarded the mountain passes. They served as a refuge to travelers from brigands and the elements and as a safe haven to the local communities whenever they were under siege. 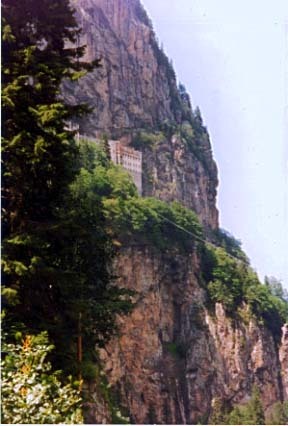 Monastic complexes along the Trabzon-Gumushane route included St. George Peristereota, St. John Prodromos of Vazelon, the Virgin of Soumelas, St. Gregory Nysse, the Virgin of Lachana and St. George Choutoura. These monasteries once sat on cliffs high above the valleys and provide an excellent vantage point for alpine scenery and lush meadows full of wildflowers and unique birdlife. 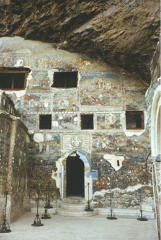 They now lay in ruins except the 14th century Sumela monastery which is under restoration in spite of extensive damage to the frescoes and artwork. The magnificent facade remains intact, tucked into a crevice of a towering cliff above a deep gorge that echoes the melody of a lively mountain stream. In 38AD, two monks from Athens, Barnabas and Sophronius, were led by the famous icon, the Panayia Atheniotissa, to establish a skete (hermitage) in a cave on Mt. Mela. The area became known as Panagia tou Melas and eventually Soumelas or Sumela. The humble hermitage grew slowly until the 14th century when the Empire prospered and the monastic complex was constructed with rich endowments of land and money. It boasted 72 rooms, beautiful 14th and 18th century frescoes and an impressive library of priceless manuscripts that were hastily abandoned at the time of the population exchange between Greece and Turkey in 1923. Fire and vandalism have destroyed much of the original facility but a lone monk returned in 1931 to dig up the treasures from their secret hiding place. The icon was recovered and can be seen at the Benaki museum in Athens but the manuscripts had crumbled away. Uzungol (Long Lake) and Ayder are popular weekend destinations for local people who like to picnic, fish for trout, enjoy the mountain meadows and in Ayder, relax in the warm waters of the thermal springs. Tea plantations and citrus grovesof the coastal slopes give way to deciduous forests of chestnut, beech and hornbeam that eventually become mixed with pines until only pine forests remain interspersed with grassy meadows that are carpeted with wildflowers. Many birds are found in these high altitude forests and include Caucasian Blackcocks, Caspian Snowcocks, Lammergeiers, Griffon Vultures, Green Warblers, Mountain Chiffchaffs and other species. Particularly interesting are these and nearby mountain villages with their wooden chalets and tandoori wood-burning ovens that were used for cooking and to provide warmth. Many villages now have electricity and modern stoves but some people still prefer the "old ways." Uzungol, with its one-of-a-kind 250 year old covered bridge, is reached by a scenic road from the coastal town called Of from the Greek word 'Ofis' meaning 'snake.' The road to Ayder follows the Firtina (Storm) River and forks to the left just before arriving at Camlihemsin. The Firtina Valley is especially picturesque with tea plantations that line its banks, graceful, old stone bridges and the beautiful Zil Kale (Zir Castle) standing guard over a misty gorge that once served as an alternate route to the Black Sea. Trails for day hikes, trekking and peak ascents begin in both Uzungol and Ayder. However, Ayder has been more popular with foreigners because it is one of the main trailheads to the Kackar Mountains. The attraction of the Kackars centers around beautiful alpine scenery with coniferous forests, glacial lakes and powerful streams as well as an intricate blend of cultures that include the ethnic minorities of Georgian, Armenian, Hemsin and Laz peoples. The most popular trekking routes in the Kackars encompasses the region between Ayder and Altiparmak (Barhal). However, in the summertime, most treks originate in Barhal on the southern face of the mountains where it is drier since starting at Ayder usually involves setting up camp in the rising afternoon mists. There are two major trekking routes in the Kackar Mountains with side trips to peaks and other areas of interest. One begins at Barhal and follows the Barhal Valley before ascending to the yaylalar of Naznara and Amaneskit. Here, there are excellent views of the Altiparmak Mountains which are very rugged and require technical climbs to reach many of the peaks. The trail swings south to the Kisla Valley and leads up to the pass at Kirmizi Gedik before descending to the yayla at Avecor (Avusor). It is populated by Laz people who are of South Caucasian origin with a distinct but unwritten language. Women wear colorful clothing and men are noted for performing their traditional dance, the horon. Ayder is 3-4 hrs. hiking below Avecor. The other route is a roughly circular route that surrounds the main peaks, Kackar and Mezovit, of the Kavron Mountains. It is defined by the Kavron, Dupeduz and Buyuk mountain streams. From this main trail, Kackar Peak is more easily reached by the path up the southern flank because there are glaciers on its northern face. Side trails lead to Ayder in the north, Hevek (Yaylalar) and Barhal in the east, Cat in the west and the Coruh valley near Camlikaya to the south. This route is exquisitely beautiful with snow clad mountains, pristine lakes, endless valleys, flowered meadows, wild orchids and grassy tracks. During the Bronze Age, Georgians settled in the valleys of the Coruh River and its tributaries. 12th century BC Assyrian records confirm that Georgian tribes occupied these lands and centuries later, they were still living autonomously in the area. Retreating from the Persian campaigns in 401-399 BC, Xenophon describes hostile encounters with Colchians, Taochi (Daiaeni) and other Georgian tribes. It was not until the 9th century that Ashot I, a Bagrati prince and ruler of the southern provinces of Georgia, began to build a powerful state. His territory included Tao and Klarjeti (now located in Turkey) and many Georgian churches, monasteries, fortresses and castles were built in the region between the 10th and the 12th centuries. The Coruh River is renowned as one of the fastest flowing rivers in the world with many class 5 rapids. It originates in the Mescit Daglari just south of Ispir and flows in a southwesterly direction towards Bayburt. Many rafting trips begin in relatively calm water at Maden and continue to Bayburt which boasts the largest fortress (6th century) in all of Turkey. Here, the river turns approximately 180 degrees and flows north easterly to Ispir. The 60 mile trip on class 2-3 water takes about 3 days through a pastoral landscape with isolated settlements. Orchards, vineyards and vegetable gardens dominate the river banks in the valley of the area around Ispir, an old medieval town that seems to have become lost in time. It was once a prominent fortress city buffered between the massive Kackar and Mescit Mountains with river access to the Black Sea as well as an overland route to the west of Rize via the highest mountain pass in northeast Turkey, the Ovitdagi Gecedi. The dilapidated fortress and the Bagratid castle belie its distinguished history as a city that was equal to Bayburt in economic importance and from which sprang the Bagratid Dynasty whose princes ruled Georgia for almost a thousand years. Beyond Ispir, the river begins to wield its awesome power. It narrows considerably causing the water to swell and foam as it passes through a deep rocky gorge with rapids to challenge the most experienced paddler. It is a difficult section especially when the river is full and some may want to take the road to a calm stretch below the gorge that serves as a put-in for shorter rafting trips on the Coruh River. Fruits and vegetables are grown intensively on the river banks, a mass of greenery that contrasts with the parched slopes that rise from the valley. Several streams from the Kackar Mountains empty into the Coruh and about 8 miles past Camlikaya, a trail follows one such stream up to the popular loop trail around the Kavron peaks. The river flows for about 30 miles between Camlikaya and Yusufeli with a number of class 5 rapids. This section of the river combines challenging whitewater (Class 3, 4 and 5) with magnificent scenery and a rich cultural heritage. Below Camlikaya and all the way to Yusufeli, terraced rice paddies on the river's banks are maintained by a complicated network of irrigation channels. The river passes by a number of hamlets and villages with interesting old bridges and ruins. From Tekkale, a side valley leads up to a 10th century Georgian church, the Otkha Eklesia which is Georgian for "four churches." Most guidebooks claim that this is the only remaining church of the original four but locals say that there are three other churches. One is a small chapel much further (6 hrs. round trip) up the same valley as the Otkha Eklesia on a mountain ridge. Another is just downstream from Tekkale on a rocky bluff where a ruined fortress and chapel overlook the Coruh River. The ruins of the third is also located downstream from Tekkale but it is hidden on the northern bank of the river. Contrary to the maps, the entire area including Tekkale is considered by locals to be "Dortkilise" which is Turkish for "four churches." Yusufeli's daily, year round dolmus service to Barhal and Hevek, popular trailheads to the Kackar Mountains, attracts trekkers, mountain climbers, ornithologists and lepidopterists. Bird watchers are particularly interested in the threatened colonies of red vultures that live in the cliffs while butterfly collectors have a field day with the thousands of butterflies that swarm the Kackar valleys. Yusufeli's location at the confluence of the Coruh and Oltu Rivers makes it a convenient hub to the scattered fortresses, castles and churches that lay along the Coruh, Oltu and Tortum River valleys. The Oltu River empties into the Coruh about 6 miles past Yusufeli where the increased water volume causes the river to pick up speed considerably. Eight miles beyond the merging of the rivers, rafters test their mettle on the wildest waters of the Coruh with steep falls, churning holes and raging rapids including the notorious 'King Kong.' Having expended its exuberance, the river becomes calmer and the last 12 miles before Artvin are downright sedate with Class 1 to 2 water. The yaylalar (high pastures) are inhabited from late May to early September. This is the most practical period for hikers and visitors to go there. Afternoon mists from mid June to the end of August make September and October better months for high altitude hiking but the compromise is the lost opportunity for meeting some remarkable people. The rivers present the most challenge when they are fullest from June to mid July. Water levels are significantly lower after mid July but rafting trips are available until September/October. There are regular buses to Trabzon and Erzurum from the major cities of Turkey. Local buses travel from Trabzon and Erzurum to the nearby towns and villages but access to the isolated mountain villages may be sporadic and usually limited to dolmus service. Regular domestic flights are available to Trabzon and Erzurum where cars may be rented locally. The Eastern Black Sea Mountains are best explored on your own by car. Turkish Maritime Lines provide ferry service from Istanbul to coastal towns of the Black Sea. The ferry leaves Istanbul on Monday (14:00) and arrives in Trabzon on Wednesday morning (9:30). It departs from Trabzon on Wednesday evening (19:30) and arrives in Istanbul on Friday (15:00). There are rail connections to Erzurum but no service to Trabzon. Train travel is comfortable and inexpensive but slow. If you have the time to savor the experience, sleeper compartments are recommended for long journeys. The Eastern Black Sea region ranges from a semi tropical coastal zone to an alpine mountain zone necessitating both warm and cool weather clothing in the summer months. Rain gear is also needed because the coast has warm, rainy weather and misty summers while the mountains are wet and cool on their northern faces. The southern flanks are dry and warm. The following are suggested for high altitude hiking: a woolen hat, warm gloves, thermal underwear and socks and a down filled parka. Sturdy hiking boots are required for extensive hiking or to make peak ascents. Camping gear is also needed for exploring the Black Sea Mountains due to the great distances between settlements. Good walking shoes are adequate for summer day hikes along the lower altitude trails although there are some spots where you will wish that you had brought your hiking boots. Provisions and supplies (including toilet paper) should be purchased in the larger towns before traveling to the mountains. A well stocked medical emergency kit is strongly advised as medical attention and supplies are limited in the remote mountain villages of Eastern Turkey. 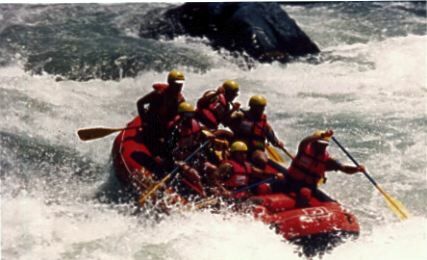 Rafting operators provide all equipment and provisions for their trips. Special precautions should be taken to protect your camera and other electronic equipment since spills are likely on the rougher stretches when the river is full. Bring your own sunscreen and mosquito repellent. Generally, women traveling to Eastern Turkey should bring a long skirt, sweater and pretty shawl. They can quickly be slipped on over casual clothes when visiting villages or mosques. Immodest clothing (shorts, short skirts, tank tops, tight fitting clothes) still invites unwanted attention in this conservative region. It is uncomfortable enough to be leered at but having a hand up your skirt or your breast fondled can be unnerving. When planning to visit other areas of Turkey, consider flying if time is a factor. Turkish Airlines offers coupons for national flights in conjunction with their airline tickets from the US and Europe. These coupons are excellent bargains that cost $70-$100 per leg. Bus travel within Turkey is easy and inexpensive but heavy smoking by Turks make long distance travel uncomfortable for those who are sensitive to smoke. Driving in northeastern Turkey is relatively easy. The main roads are adequate, although curvy. Many of the roads through the mountain passes are continually being repaired because of the severe winters. Truck and bus drivers can be terrifying so pull over and let them pass. We recommend that you drive slowly, limit your traveling to the daylight hours and fill your tank whenever you have the opportunity. Navigating throughout Eastern Turkey will challenge puzzle lovers and frustrate others. Depending on the map that you are using, roads may or may not exist, place names may or may not be the current name or the locally used name, and some names may be used in three or four different places within the same general region. The only solution is to be flexible and enjoy wherever you may find yourself. Two Western style hotels that we saw in this part of Turkey were the Hotel Usta in Trabzon (tel. 90-462-326-5700, fax. 90-462-322-3793) and the Dedeman Hotel in Rize (tel. 90-464-223-4444, fax. 90-464-223-5348). These cost about $60 and $135 respectively for a double room. There are a number of lesser priced hotels that are clean and adequate but be aware that they are older and quite drab. Rooms are readily available in the summer settlements and small villages although most are very modest. For those who travel without a fixed itinerary, we recommend a sleeping bag liner or a large sheet that can be doubled over. This will be helpful in uncertain travel conditions. Arrangements for guides and pack mules (if needed) may be made in Ayder and Yusufeli. The muhtar (village headman) is a good source of information. English speaking mountain guides cost about $75 per day and is the major expense in putting your own trek together. All-inclusive organized treks or rafting expeditions cost about $125 per person per day. Do respect the conservative culture of rural Turkish life. Modesty and polite manners are appreciated. Always ask permission if you plan to camp when you visit the yaylalar. The arrival of a foreigner will be brought to the attention of the muhtar (village headman) so it is rarely a problem to locate him. Mountain villagers are kind and friendly people. They enjoy visitors and will usually have at least one villager who speaks your language. Plan to hire a local guide when trekking the mountains of the Eastern Black Sea. Topographical maps are difficult to find and it is easy to become lost in these isolated and rugged mountains. Visit some of the lovely Georgian churches of the Coruh, Tortum, Oltu and Barta river valleys. Many are quite remote but your effort will be well rewarded with the euphoria of discovery and the relish of magnificent scenery. Allocate some time to explore Old Erzurum with its 5th century Byzantine fortress and city walls, elegant 12th century Saltuk Ulu Cami (Great Mosque), impressive 13th century Seljuk Cifte Minareli Medrese (Twin Minaret Seminary), 14th century Mongol Yakutiye Medrese (Yakutiye Seminary) and 16th and 17th century Ottoman mosques. Purchase a good road map prior to leaving home. They are difficult to find in Turkey, especially outside the main cities. A rafting trip on the Coruh River is a must. Even if time does not allow for a lengthy expedition, a one day trip starting in Tekkale or Yusufeli will generate memories that last a lifetime. Mr. Orhan Aksu, president of Afacan Tour, is a friendly and helpful gentleman who is very knowledgeable about traveling in northeastern Turkey. He offers numerous local tours (city tours of Trabzon and Erzurum, Sumela Monastery etc.) that are well priced with multi-lingual guides as well as customized adventure tours for trekking and mountain climbing. His cultural tours reflect the mixed culture of the border areas of northeast Turkey and include excursions to Armenia, Georgia and Azerbaijan. Afacan Tour provides general information about these countries as well as assistance in procuring the necessary visas. Alternatif Outdoor offers a variety of exciting options for adventure throughout Turkey. It is the only Turkish company that offers rafting tours on the Coruh River. White water kayaks are available for rent and individuals with Grade 5 white water skills are invited to join their scheduled expeditions. Blue Guide: Turkey by Bernard McDonagh has a good historical description of the Sumela Monastery and other sites of cultural and archaeological significance. Turkey: The Rough Guide by Rosie Ayliffe, Marc Dubin and John Gawthrop is an excellent guide to the Black Sea area and to Turkey in general with a good balance of factual and practical information. There are detailed directions to the Monasteries of Vazelon and Peristera. Turkey: A Lonely Planet Travel Survival Kit by Tom Brosnahan and Pat Yale has a good selection of accommodations available along the Black Sea Coast and the major towns of northeastern Turkey. Trekking in Turkey by Marc Dubin and Enver Lucas is a Lonely Planet publication that describes many of the hiking routes in Turkey including an excellent section on the Kackar Mountains with detailed maps and itineraries. This book has an interesting chapter on the 'People and Culture of Rural Turkey' as well as a helpful Equipment List. 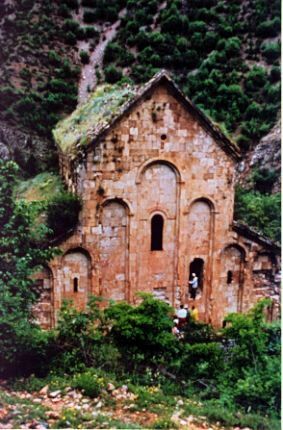 Baedeker's Turkey has comprehensive information about the Georgian churches around Artvin. The accompanying country map is readily available and is one of the better maps with major footpaths and many of the smaller villages. Pontus - Anatolia: Images of a Journey by Marianna Koromila is an exquisite photographic journey along the Pontus Euxinos of Asia Minor, now the Black Sea coast of Turkey. It provides a rich history of the customs and traditions of the area. It is published in Athens and is found in major Greek bookstores.